You may request a printed copy of this document, which includes a table of contents, by telephoning Customer Service at 1-800-362-1688. A NEW ACCOUNT – To help the government fight the funding of terrorism and money laundering activities, federal law requires all financial institutions to obtain, verify, and record information that identifies each person who opens an account. AND FAX TRANSMISSIONS) – We sometimes receive customer requests to transmit Non-Public Personally Identifiable Financial Information (“NPI”) (for example, account numbers, copies of checks, copies of statements, etc.) via fax and/or email. This notice is to make you aware of the risks associated with communicating via traditional email and fax servers and that we offer a free encrypted email service to customers. often stored on servers owned by the service providers (for example, the Internet Service Provider). We have implemented secure email solutions to protect incoming and outgoing email and any NPI that may be included in the email. Bankers Trust customers can create a free secure and email account by visiting www.bankerstrust.com. We recommend using the secure email service for all of your communications with the Bank, but particularly for any email containing NPI. Information delivered through unencrypted email or fax is sent via public communication medium and is at risk of interception. You should consider this risk concerning the use of these electronic communication mediums. Because we provide secure email encryption, by using a public communication medium you agree to indemnify and hold harmless Bankers Trust from any liability which results therefrom. DEPOSITS OF NON-U.S. ITEMS – For items deposited which are drawn on foreign banks, we may withhold provisional credit for a longer period of time than the time specified in our Funds Availability Policy. We may refuse to accept for deposit or collection an item that is payable in currency other than U.S. Dollars or an item that is drawn on a financial institution not chartered in the U.S. When we do accept such an item, you accept all risk associated with foreign currency fluctuation (exchange rate risk) and with any late return of the item. When we credit your account for an international item, we use our applicable currency exchange rate on the day the item is processed to determine the U.S. dollar amount of the credit. When we reverse a credit for a foreign item, we use our applicable currency exchange rate on the day we reverse the credit to determine the amount of the debit. Currency exchange rates are highly volatile and our rate on the day of the credit is likely to be different (sometimes very different) than our rate on the day of the debit. You understand and agree that this may result in a currency exchange loss to you. DEMAND DRAFTS – If you deposit a demand draft (an unsigned draft or a preauthorized draft) into your account, you warrant and guarantee that the draft is authorized. Generally – Any of you, acting alone, who signs to open the account or has authority to make withdrawals may withdraw or transfer all or any part of the account balance at any time. Each of you (until we receive written notice to the contrary) authorizes each other person who signs or has authority to make withdrawals to endorse any item payable to you or your order for deposit to this account or any other transaction with us. Overdrafts – You understand that we may, at our discretion, honor withdrawal requests that overdraw your account. However, the fact that we may honor withdrawal requests that overdraw the account balance does not obligate us to do so later. So you can NOT rely on us to pay overdrafts on your account regardless of how frequently or under what circumstances we have paid overdrafts on your account in the past. We can change our practice of paying overdrafts on your account without notice to you. You can ask us if we have other account services that might be available to you where we commit to paying overdrafts under certain circumstances, such as an overdraft protection line-of-credit or a plan to sweep funds from another account you have with us. You agree that we may charge fees for overdrafts. For consumer accounts, we will not charge fees for overdrafts caused by ATM withdrawals or one-time debit card transactions if you have not opted-in to that service. We may use subsequent deposits, including direct deposits of social security or other government benefits, to cover such overdrafts and overdraft fees. See the sections beginning with Overdraft Processing for complete details about Overdraft services. DORMANT ACCOUNT – An account is considered dormant if there have been no deposits into or withdrawals from the account and we have received no communication from you regarding the account for a period of 24 months for a checking or savings account. However, our normal fees for maintaining the account may continue to apply as allowed by law. Under Section 556.2 of the Iowa Code, if you are an Iowa resident and your account has had no activity for a period of three (3) years or if we have had no other contact with you, we may be required to surrender the funds in your account to the custody of the Treasurer of the State of Iowa as unclaimed property. Arizona residents are subject to the laws under the Arizona Unclaimed Property Act, Arizona Revised Statutes (A.R.S.) § 44- 302, which requires property that is considered unclaimed be surrendered to the Arizona Department of Revenue. Arizona law also defines unclaimed bank accounts as those that have had no activity or owner/bank contact for a period of three (3) years. If your last known address is in a state other than Iowa or Arizona, we may be required to surrender the funds in your account to the Treasurer of such state as unclaimed property. In such event, claim for recovery must be made directly to the Treasurer of the applicable state. Once your funds are surrendered, we no longer have any liability or responsibility with respect to the funds. PRIMARY CHECKING – Primary checking is an account in which you routinely deposit the majority of your income or benefits from any source, and against which you routinely authorize payment of the majority of your expense each calendar month. TRUNCATION – Images of canceled checks will not be returned with your monthly statement. Standard research fees, as disclosed in the Bankers Trust Service Fee Schedule, will apply when obtaining imaged copies of canceled checks. We may accept an order to stop payment on any item from any one of you. You must make any stop-payment order in the manner required by law and we must receive it in time to give us a reasonable opportunity to act on it before our stop-payment cutoff time. Because stop-payment orders are handled by computers, to be effective, your stop-payment order must precisely identify the number, date, and amount of the item, and the payee. You may stop payment on any item drawn on your account whether you sign the item or not. Generally, if your stop-payment order is given to us in writing it is effective for 12 months. Your order will lapse after that time if you do not renew the order in writing before the end of the 12-month period. If the original stop-payment order was oral your stop-payment order will lapse after 14 calendar days if you do not confirm your order in writing within that time period. We are not obligated to notify you when a stop- payment order expires. A release of the stop-payment request may be made by anyone authorized to transact on the account, whether or not the stop-payment request was initiated by that person. Our stop-payment cutoff time is one hour after the opening of the next banking day after the banking day on which we receive the item. If you are placing a stop payment order on an item one hour after the opening of the next banking day after the banking day on which we receive the item, you must place the stop payment order in person or by telephone to a bank employee (i.e. it is too late to place a stop payment online or via our automated telephone service). Additional limitations on our obligation to stop payment are provided by law (e.g., we paid the item in cash or we certified the item). TRANSFER LIMITATIONS – For savings and money market accounts you may make up to six transfers or withdrawals by means of a preauthorized, automatic, or telephonic transfer to another account of yours or to a third party or by check, debit card, or similar order to a third party during any calendar month (or statement cycle of at least four weeks). A preauthorized transfer includes any arrangement with us to pay a third party from your account at (i) a predetermined time; (ii) on a fixed schedule or (iii) upon oral or written orders including orders received through the automated clearing house (ACH). If the transfer or withdrawal is initiated in person, by mail, or at an ATM then there is no limit on the number of payments that may be made directly to you, directly to us for amounts you owe us, or transfers to other accounts you have with us. Withdrawals by phone are also unlimited if you are requesting that a check be mailed to you. All transfers over six per statement cycle, whether restricted by regulation or not, are subject to an Excessive Debits Fee as disclosed in the Truth-in-Savings section of this document. NOTICES – Any written notice you give us is effective when we actually receive it, and it must be given to us according to the specific delivery instructions provided elsewhere, if any. We must receive it in time to have a reasonable opportunity to act on it. If the notice is regarding a check or other item, you must give us sufficient information to be able to identify the check or item, including the precise check or item number, amount, date and payee. Written notice we give you is effective when it is deposited in the United States Mail with proper postage and addressed to your mailing address we have on file. TEMPORARY ACCOUNT AGREEMENT – If the account documentation indicates that this is a temporary account agreement, it means that all account owners have not yet signed the signature card, or that some other account opening requirement has not been completed. We may give you a duplicate signature card so that you can obtain all of the necessary signatures and return it to us. Each person who signs to open the account or has authority to make withdrawals (except as indicated to the contrary) may transact business on this account. However, we may at some time in the future restrict or prohibit further use of this account if you fail to comply with the requirements we have imposed within a reasonable time. AUTHORIZED SIGNER – The authorized signer is merely designated to conduct transactions on the owner’s behalf. The owner is responsible for any transactions of the authorized signer. We undertake no obligation to monitor transactions to determine that they are on the owner’s behalf. RESTRICTIVE LEGENDS OR ENDORSEMENTS – The automated processing of the large volume of checks we receive prevents us from inspecting or looking for restrictive legends, restrictive endorsements or other special instructions on every check. Examples of restrictive legends placed on checks are “must be presented within 90 days” or “not valid for more than $1,000.00.” The payee’s signature accompanied by the words “for deposit only” is an example of a restrictive endorsement. For this reason, we are not required to honor any restrictive legend or endorsement or other special instruction placed on checks you write unless we have agreed in writing to the restriction or instruction. Unless we have agreed in writing, we are not responsible for any losses, claims, damages, or expenses that result from your placement of these restrictions or instructions on your checks. FORGERIES, MISSING SIGNATURES, ALTERATIONS – As used in this Agreement, an “item” includes a check, draft, demand draft, preauthorized draft or other order or instruction for the payment, transfer or withdrawal of funds (including a withdrawal slip), automatic transfers and electronic transactions (including ACH, ATM and POS). An “item” also includes any writing created or authorized in your name that would be a check or draft if it was signed. We are not responsible for reviewing the number or combination of signatures on an item drawn against your account. This means that if you indicated that more than one signature is required in connection with an item drawn on your account, we are not liable to you if a transaction is conducted on or through your account contrary to the signature requirements you specified, provided at least one of the required signatures appears on the item. We are not liable to you for failing to detect a forgery of your signature or an alteration of one of your items if the forgery or alteration is such that a reasonable person is not reasonably expected to detect it. Our policy is to process electronic transactions, such as ACH, debit card, online or wire transfers first, in the order they are received on the day they are processed. We process checks and similar items second, in numerical order (by check number) on the day they are processed. If a check, item or transaction is presented without sufficient funds in your account to pay it, we may, at our discretion, pay the item (creating an overdraft) or return the item for insufficient funds (returned item). We will not charge you a fee for paying an overdraft of an ATM or everyday debit card transaction if this is a consumer account and you have not opted-in to that service. The amounts of the overdraft and returned item fees are disclosed elsewhere, as are your rights to opt in to overdraft services for ATM and everyday debit card transactions, if applicable. We encourage you to make careful records and practice good account management. This will help you to avoid creating items without sufficient funds and potentially incurring the resulting fees. OVERDRAFT PROCESSING – If a check or ACH or recurring debit card transaction is presented without sufficient funds in your account to pay it, we may, at our discretion, pay the check or ACH or recurring debit card transaction (creating an Overdraft) or return the check or ACH or recurring debit card transaction (Returned Item). We reserve the right not to pay if, for example, your account is not in good standing, or you are not making regular deposits, or you have too many overdrafts. If we do not authorize an overdraft by check, ACH, or other means, your transaction will be returned and a Returned Item fee will be assessed. Additionally, you may choose not to have your overdrafts paid (“opt out”) by notifying us in writing at the address listed in this document, by telephone at the telephone number listed in this document, or by stopping into any of our office locations. If you opt out, your check and ACH transactions creating an overdraft will be returned unpaid and a Returned Item fee will be assessed. The merchant to whom you wrote the check or authorized the transaction may also assess a fee. You may opt in to overdraft services for ATM and one-time debit card transactions. If you do not opt in to overdraft services for ATM and one-time debit card transactions and your account does not have sufficient funds to complete a transaction you have initiated, the transaction will generally be declined. If you opt in to overdraft services and your account does not have sufficient funds to complete a transaction you have authorized, the transaction may be approved and an Overdraft Fee will be charged. Regardless of your opt in selection, we pay overdrafts at our discretion, which means we do not guarantee that we will always authorize and pay any type of transaction. The amounts of the Overdraft and Returned Item fees are disclosed in our Service Fee Schedule provided to you in conjunction with this document and as amended from time to time. OVERDRAFT FEES – An Overdraft fee is imposed for overdrafts created by checks, in-person withdrawals, automated clearinghouse (ACH) withdrawals, or recurring debit card withdrawals. An Overdraft fee is imposed for any overdraft created by ATM withdrawal or one-time debit card withdrawal only if you opt-in to overdraft services. A daily limit on Overdraft fees, as disclosed in the Service Fee schedule, applies. A Returned Item fee is assessed for check and ACH withdrawals that are returned unpaid. There is no daily limit on the amount of Returned Item fees that an account may be charged per day. The Service Fee Schedule is provided to you in conjunction with these terms and conditions, and may be updated from time to time with notification to you. OVERDRAFT COVERAGE – The amount of overdraft coverage varies and depends on a number of factors including: 1.) How long you have held your account at Bankers Trust, 2.) Whether you make regular deposits to the account, and 3.) How long your account remains in an overdraft position. For accounts in good standing, overdraft coverage ranges between $100.00 and $500.00, plus any fees that may be assessed. You must make a deposit to cover the overdraft balance as soon as possible, but under no circumstances should the account remain overdrawn 10 or more business days. If a deposit sufficient to cover the overdraft and any related fees is not made within 10 business days of when the first overdraft occurred, your account may be closed. Any items received on or after the day the account is closed will be marked “Account Closed” and returned unpaid. Information about accounts closed due to overdrafts may be reported to credit bureaus. Late payments, missed payments, or other defaults on your account may be reflected in your credit report. This information will remain on file with the agencies for seven years, and may impair your chances of obtaining future deposit accounts at a financial institution. A link between savings and checking accounts, which transfers money from your savings to your checking account in the event of a checking account overdraft. *Transfers are subjected to a Transfer Fee, as disclosed in our Service Fee Schedule. A Checking Reserve line of credit, which transfers money in $100 increments, or Home Equity Line of Credit, which transfers money in $500 increments, up to your credit limit, when an overdraft occurs on your checking account. These lines of credit are subject to credit approval and an annual fee, as disclosed in our loan agreement with you. A Bankers Trust credit card, which automatically transfers money for the amount of the overdraft or $25.00, whichever is greater, up to your credit limit, when an overdraft occurs in your checking account. The fee for these types of transfers is disclosed in the credit card agreement. This line of credit is subject to our prior credit approval. The Service Fee Schedule is provided to you in conjunction with these terms and conditions, and may be updated from time to time with notification to you. Internet Banking, which allows you to manage your account online and via mobile device. You can enroll at www.bankerstrust.com. You may sign up for low-balance e-mail and text message alerts using the service. Easy Access, which allows you to manage your account by telephone. You can access this service at (515) 245-5252 or toll free at 1-800-932-3279. See the Bankers Trust Important Overdraft Information brochure for complete details about Overdraft services. Except for consumer electronic funds transfers subject to Regulation E, you agree that if we offer you services appropriate for your account to help identify and limit fraud or other unauthorized transactions against your account, and you reject those services, you will be responsible for any fraudulent or unauthorized transactions which could have been prevented by the services we offered, unless we acted in bad faith or to the extent our negligence contributed to the loss. If we offered you a commercially reasonable security procedure which you reject, you agree that you are responsible for any payment order, whether authorized or not, that we accept in compliance with an alternative security procedure that you have selected. TO RECEIVE COMMUNICATIONS – We may monitor or record phone calls for security reasons, to maintain a record and to ensure that you receive courteous and efficient service. You consent in advance to any such recording. We need not remind you of our recording before each phone conversation. ACH AND WIRE TRANSFERS – This agreement is subject to Article 4A of the Uniform Commercial Code – Fund Transfers as adopted in the state in which you have your account with us. If you originate a fund transfer and you identify by name and number a beneficiary financial institution, an intermediary financial institution or a beneficiary, we and every receiving or beneficiary financial institution may rely on the identifying number to make payment. We may rely on the number even if it identifies a financial institution, person or account other than the one named. You agree to be bound by automated clearing house association rules. These rules provide, among other things, that payments made to you, or originated by you, are provisional until final settlement is made through a Federal Reserve Bank or payment is otherwise made as provided in Article 4A- 403(a) of the Uniform Commercial Code. If we do not receive such payment, we are entitled to a refund from you in the amount credited to your account and the party originating such payment will not be considered to have paid the amount so credited. Credit entries may be made by ACH. If we receive a payment order to credit an account you have with us by wire or ACH, we are not required to give you any notice of the payment order or credit. FACSIMILE SIGNATURES – Unless you make advance arrangements with us, we have no obligation to honor facsimile signatures on your checks or other orders. If we do agree to honor items containing facsimile signatures, you authorize us, at any time, to charge you for all checks, drafts, or other orders, for the payment of money, that are drawn on us. You give us this authority regardless of by whom or by what means the facsimile signature(s) may have been affixed so long as they resemble the facsimile total of funds combined in all of your other insured accounts with us. If you want a more detailed explanation or additional information, you may ask us or contact the FDIC. You can also visit the FDIC website at www.fdic.gov and click on the Deposit Insurance link. The link includes detailed contact information as well as a deposit insurance estimator. POWER OF ATTORNEY – You may wish to appoint an agent to conduct transactions on your behalf. (We, however, have no duty or agreement whatsoever to monitor or insure that the acts of the agent are for your benefit.) This may be done by allowing your agent to sign in that capacity on the signature card or by separate form, such as a power of attorney. A power of attorney continues until your death or the death of the person given the power. If the power of attorney is not “durable,” it is revoked when you become incompetent. We may continue to honor the transactions of the agent until: (a) we have received written notice or have actual knowledge of the termination of the authority or the death of an owner, and (b) we have had a reasonable opportunity to act on that notice or knowledge. You agree not to hold us responsible for any loss or damage you may incur as a result of our following instructions given by an agent acting under a valid power of attorney. STALE-DATED CHECKS – We are not obligated to, but may at our option, pay a check, other than a certified check, presented for payment more than six months after its date. If you do not want us to pay a stale-dated check, you must place a stop-payment order on the check in the manner we have described elsewhere. FDIC INSURANCE – Funds in your account(s) with us are insured by the Federal Deposit Insurance Corporation (FDIC) and backed by the full faith and credit of the United States. The amount of insurance coverage you have depends on the number of accounts you have with us that are of different “ownership.” An individual account is one unique form of “ownership”; a joint account, a pay-on-death account, and a self-directed qualified retirement account (e.g., an IRA) are examples of some of the others. Deposit insurance for a person’s self-directed qualified retirement account is up to $250,000. (An IRA is a self-directed qualified retirement account as is any account where the owner decides where and how to invest the balance.) Funds are insured to $250,000 per depositor for the total of funds combined in all of your other insured accounts with us. If you want a more detailed explanation or additional information, you may ask us or contact the FDIC. You can also visit the FDIC website at www.fdic.gov and click on the Deposit Insurance link. The link includes detailed contact information as well as a deposit insurance estimator. To ensure that your check or share draft is processed without delay, you must endorse it (sign it on the back) in a specific area. Your entire endorsement (whether a signature or a stamp) along with any other endorsement information (e.g. additional endorsements, ID information, driver’s license number, etc.) must fall within 11/2″ of the “trailing edge” of a check. Endorsements must be made in blue or black ink, so that they are readable by automated check processing equipment. As you look at the front of a check, the “trailing edge” is the left edge. 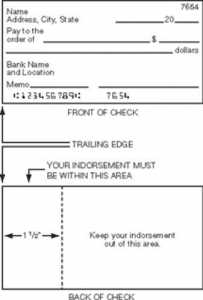 When you flip the check over, be sure to keep all endorsement information within 11/2″ of that edge. ADDRESS OR NAME CHANGES – You are responsible for notifying us of any change in your address or your name. Unless we agree otherwise, change of address or name must be made in writing by at least one of the account holders. Informing us of your address or name change on a check reorder form is not sufficient. We will attempt to communicate with you only by use of the most recent address you have provided to us. A Returned Mail Fee, as disclosed in the Service Fee Schedule, will be assessed every month after 90 days if the address is not updated. a claim arising by operation of law. The hold may be placed for such period of time as we believe reasonably necessary to allow a legal proceeding to determine the merits of the claim or until we receive evidence satisfactory to us that the dispute has been resolved. We will not be liable for any items that are dishonored as a consequence of placing a hold on funds in your account for these reasons. LARGE CASH WITHDRAWALS – If you want to cash a check (or make a cash withdrawal) for a very large sum, we may require five business days advance notice so that we can order the cash from our vault. We may, but are not obligated to, require that you provide adequate security. We also may require that you arrange for a pickup of the cash at our central vault or other location by an armored courier, acceptable to the bank, at your sole risk and expense. ACCOUNT ORGANIZATION – Your account may, at our option, be divided into two sub-accounts in order to allow us to modify our reserve requirements as defined by Regulation D. The sub-accounts will be composed of a savings account and a transaction account and we may allocate funds between the sub-accounts as we deem appropriate. Items drawn against your account will be presented for payment against the transaction sub-account and funds in the savings sub-account will be transferred to cover Items presented against the transaction sub-account as may be needed. Such division is strictly for internal bank purposes and will not affect the operations of your account in any way. If your account earns interest, the use of sub-accounts will not affect the interest you earn. Electronic funds transfers initiated by accountholders. You may establish regularly scheduled debit or credit transfers between your checking or savings account at Bankers Trust and an account at another financial institution. Please also see Transaction Limitations section regarding limitations that apply to savings accounts. Please also see Transaction Limitations section regarding limitations that apply to telephone transfers. ATM Deposits. You may make deposits at any ATMs that provide the service. At our discretion, we may limit your ability to make deposits at an ATM machine. Please also see Transaction Limitations section regarding limitations that apply to ATM transfers and savings accounts. Types of Debit Card Point-of-Sale Transactions – You may access your checking account(s) to purchase goods (in person, by phone, or on the Internet), pay for services (in person, by phone, or on the Internet), and get cash from a merchant, if the merchant permits, or from a participating financial institution. You may use your debit card everywhere that Visa® debit cards are accepted. Debit Card Activity Requirements. Your debit card must be used to complete a transaction at least once in a six-month period or the system will deactivate the card. This security feature is enabled to protect your account(s) in the event the debit card is lost or stolen. Please also see Transaction Limitations section regarding limitations that apply to debit card transactions. Advisory Against Illegal Use. You agree not to use your card(s) for illegal gambling or other illegal purpose. Display of a payment card logo by, for example, an online merchant does not necessarily mean that transactions are lawful in all jurisdictions in which the cardholder may be located. Furthermore, we reserve the right to limit or restrict your use of your card(s) at our discretion. We may invoke this right if you are using your card(s) for illegal purpose, we have been notified of fraudulent use of the card(s), or your account is no longer in good standing, for example. Internet Banking and Mobile Banking + – Your rights, responsibilities, and transaction limitations for Internet Banking and Mobile Banking + transactions are detailed in the Internet Banking agreement you receive at enrollment. We charge a replacement fee (plus applicable sales tax) for each replacement (lost, stolen, or damaged) debit card. We charge an ATM transaction fee for each transaction conducted at a non-Bankers Trust ATM. We do not charge for ACH transfers—such as paying utility bills, for example—originated by third parties. ATM Operator/Network Fees. When you use an ATM not owned by us, you may be charged a fee by the ATM operator or any network used (and you may be charged a fee for a balance inquiry even if you do not complete a fund transfer). This fee is commonly referred to as a surcharge and will be disclosed at the ATM before you complete the transaction. In limited circumstances, you may be assessed a surcharge at ATMs operated by Bankers Trust. You will receive on-screen notice of the fee before you complete the transaction. For a complete list of surcharge and transaction fee free ATMs, please refer to the ATM brochure provided in conjunction with these terms and conditions or visit www.bankerstrust.com. Please refer to the Service Fee Schedule provided to you in conjunction with this document and, as amended from time to time, for information about fee amounts. Terminal transfers. You can get a receipt at the time you make a transfer to or from your account using an automated teller machine or point-of-sale terminal. However, you may not get a receipt if the amount of the transfer is $15 or less. You will receive a record of transactions for which you did not receive a receipt on your periodic statement. (515) 245-2863 or 1-800-362-1688 to find out whether or not the deposit has been made. You may also use Easy Access to determine if a deposit has been made by calling (515) 245-5252 or 1- 800-932-3279 and using your PIN#. Periodic statements. You will get a monthly account statement from us for your checking accounts. You will get a monthly account statement from us for your savings accounts, unless there are no electronic fund transfers in a particular month. In any case, you will get a statement at least quarterly. Call or write us at the telephone number or address listed in this document in time for us to receive your request 3 business days or more before the payment is scheduled to be made. If you call, we may also require you to put your request in writing and get it to us within 14 days after you call. When the stop payment request matches the item submitted, it will be returned unpaid. Please be aware that all ACH items post to the account and are reviewed the following business day to identify any stop payment requests, before being paid or returned unpaid. If there are insufficient funds in your account at the time the item posts, your account may be temporarily overdrawn. Overdraft fees will not apply if a stop payment order has been requested; however this may affect the availability of funds in your account. We will charge you a stop payment fee (plus applicable sales tax) for each stop payment order you give or renew. We will charge you a stop payment fee (plus applicable sales tax) for each Easy Access and/or Internet Banking stop payment order you give or renew. Please refer to the Service Fee Schedule, provided to you in conjunction with this document and as amended from time to time, for information about fee amounts. Liability for failure to stop payment of preauthorized transfer. If you order us to stop one of these payments three business days or more before the transfer is scheduled, and we do not do so, we will be liable for your losses or damages (to the extent provided in the Electronic Fund Transfers Act). 5. as explained in the separate Privacy Notice. Additional Limit on Liability for Debit Card. Unless you have been negligent or have engaged in fraud, you will not be liable for any unauthorized transactions using your lost or stolen Debit Card. This additional limit on liability does not apply to ATM transactions outside of the U.S., to ATM transactions not sent over Visa or Plus networks, or to transactions using your Personal Identification Number which are not processed by Visa. Visa is a registered trademark of Visa International Service Association. Contact in event of unauthorized transfer. If you believe your card and/or code has been lost or stolen, call or write us at the telephone number or address listed in this document. You should also call the number or write to the address listed in this document if you believe a transfer has been made using the information from your check without your permission. We will determine whether an error occurred within 10 business days (5 business days for debit card point-of-sale transactions processed by Visa and 20 business days if the transfer involved a new account) after we hear from you and will correct any error promptly. If we need more time, however, we may take up to 45 days (90 days if the transfer involved a new account, a point-of-sale transaction, or a foreign-initiated transfer) to investigate your complaint or question. If we decide to do this, we will credit your account within 10 business days (5 business days for debit card point- of-sale transactions processed by Visa and 20 business days if the transfer involved a new account) for the amount you think is in error, so that you will have the use of the money during the time it takes us to complete our investigation. If we ask you to put your complaint or question in writing and we do not receive it within 10 business days, we may not credit your account. Your account is considered a new account for the first 30 days after the first deposit is made, unless each of you already has an established account with us before this account is opened. This policy statement applies to transaction accounts. Transaction accounts, in general, are accounts which permit an unlimited number of payments to third persons and an unlimited number of telephone and preauthorized transfers to other accounts of yours with us. Checking accounts are the most common transaction accounts. Feel free to ask us whether any of your other accounts might also be under this policy. For determining the availability of your deposits, every day is a business day, except Saturdays, Sundays, and federal holidays. If you make a deposit before office closing to an employee of the bank on a business day that we are open that is not also a federal holiday, we will consider that day to be the day of your deposit. However, if you make a deposit after office closing or on a day we are not open, we will consider that the deposit was made on the next business day we are open. If you make a deposit at an ATM before 6:00 P.M. Central Time on a business day that we are open, we will consider that day to be the day of your deposit. However, if you make a deposit at an ATM after 6:00 P.M. Central Time or on a day we are not open, we will consider that the deposit was made on the next business day we are open. $5,000 will be available on the ninth business day after the day of your deposit. If your deposit of these checks (other than a U.S. Treasury check) is not made in person to one of our employees, the first $5,000 will not be available until the second business day after the day of your deposit. Funds from any deposits (cash or checks) made at automated teller machines (ATMs) we do not own or operate may not be available until the fifth business day after the day of your deposit. This rule does not apply at ATMs we own or operate. For a list of ATMs we own or operate, please visit www.bankerstrust.com or call Customer Service at 1-800-362-1688. As our customer we think it’s important for you to know about substitute checks. The following Substitute Check Disclosure provides information about substitute checks and your rights. So you will recognize substitute checks when you receive them, we have included a copy of the front side of a substitute check along with an explanation of the substitute check’s components. Below is an image of a sample substitute check. The numbers listed below the image correspond with the numbers on or near the substitute check image and the corresponding text explains the various components of a substitute check. 1 An image of the original check appears in the upper right-hand corner of the substitute check. 2 A substitute check is the same size as a standard business check. 3 The information in asterisks relates to the “reconverting bank”—the financial institution that created the substitute check. 4 The information in brackets (appears sideways facing check image) relates to the “truncating bank”—the financial institution that took the original check out of the check processing system. 5 The Legal Legend states: This is a LEGAL COPY of your check. You can use it the same way you would use the original check. 6 The MICR lines at the bottom of the image of the original and at the bottom of the substitute check are the same except for the “4” at the beginning of the MICR line on the substitute check, which indicates that it is a substitute check being moved forward for collection purposes. It is also possible for the MICR line on the substitute check to begin with a “5” if the item is being returned. The rest of the MICR line is the same as the original check to ensure that it is processed as though it were the original. Minimum balance – There is no minimum balance requirement for this account. Fees – A no-activity fee of $10.99 (plus applicable sales tax) will be imposed for any statement cycle when a direct deposit (ACH credit) or Mobile Banking + Express deposit totaling at least $500.00 does not occur. The no-activity fee is waived if the primary accountholder (first-named owner) is age 55 or older. Truncation – Images of canceled checks will not be returned with your monthly statement. Standard research fees, as disclosed in the Service Fee Schedule later in this document, will apply when obtaining imaged copies of canceled checks. Fees – A no-activity fee of $10.99 (plus applicable sales tax) will be imposed for any statement cycle when a direct deposit (ACH credit) or Mobile Banking + Express deposit totaling at least $500.00 does not occur. Minimum deposit and account requirements to obtain bonus – To be eligible for the bonus, you must make a deposit of at least $200.00 to your account within the first 30 days of opening. Additionally, this account must be established as your primary checking account. A primary checking account means the account in which you routinely deposit the majority of your income or benefits from any source and against which you routinely authorize payment of the majority of your expenses each calendar month. You will receive a $100.00 bonus credited to your new Direct Checking Plus account within 30 days of account opening, provided you have met the preceding eligibility requirements as determined by Bankers Trust. Please note, in order to avoid the monthly no-activity fee, you must meet the activity requirements described in the section titled “Fees” above. Bonus exclusions – Account owner(s) must not have had an account with Bankers Trust within the last six months. Not available with any other offer. Employees of Bankers Trust and/or its affiliates are not eligible for the bonus. Account must meet the primary checking account requirement as noted above and determined by Bankers Trust. Limit one bonus per household. Early closing fee – An early closing fee of $50.00 will be charged if your account is closed within 12 months of opening. Fees – Monthly maintenance fee $15 (plus applicable sales tax). Maintenance fee will be waived if a minimum of 12 signature- or PIN-based point-of-sale debit card transactions are completed on your account. Qualifying debit card transactions must post and settle during the statement cycle. ATM transactions do not count toward the required 12 transactions. Interest rate information – Your interest rate and annual percentage yield may change. Frequency of interest rate changes – We may change the interest rate on your account at any time. Determination of interest rate – At our discretion, we may change the interest rate on your account. Daily balance computation method – We use the daily balance method to calculate the interest on your account. This method applies a daily periodic rate to the principal in the account on each day. Accrual of interest on noncash deposits – Interest begins to accrue no later than the business day on which we receive credit for the deposit of noncash items (for example, checks). Minimum balance requirement – There is no minimum balance requirement for this account. $200.00 to your account within the first 30 days of opening. Additionally, this account must be established as your primary checking account. A primary checking account means the account in which you routinely deposit the majority of your income or benefits from any source and against which you routinely authorize payment of the majority of your expenses each calendar month. You will receive $100.00 bonus credited to your account to your new BreakFree Checking account within 30 days of account opening, provided you have met the preceding eligibility requirements as determined by Bankers Trust. Bonus exclusions – Account owner(s) must not have had an account with Bankers Trust within the last six months. Not available with any other offer. Employees of Bankers Trust and/or affiliates are not eligible for the bonus. Account must meet the primary checking account requirement as noted above and determined by Bankers Trust. Limit one bonus per household. Maintenance fees – A monthly maintenance fee of $15.00 (plus sales tax, if applicable) will be imposed each statement cycle. This monthly maintenance fee may be waived by using your debit card to complete at least 12 PIN- and signature-based point-of-sale transactions each statement cycle. ATM transactions will not count toward the 12 transaction requirement. Qualifying debit card transactions must post and settle during the statement cycle. Early Closing Fee – An early closing fee of $50.00 will be assessed if your account is closed within 12 months of opening. Truncation – Images of canceled checks will not be returned with your monthly statement. Standard research fees, as disclosed in the Service Fee Schedule, will apply when obtaining imaged copies of canceled checks. Interest rate and annual percentage yield information – Your interest rate and annual percentage yield may change. Minimum balance to avoid imposition of fees – A maintenance fee of $15 (plus applicable sales tax) will be imposed every statement cycle unless you maintain either a minimum daily balance of $1,000 or a minimum average daily balance of $1,500 for the monthly statement cycle. The average daily balance is calculated by adding the principal in the account for each day of the period and dividing that figure by the number of days in the period. Non-truncation fee – (plus applicable sales tax) as disclosed in our Service Fee Schedule will be charged each month if you choose to receive your imaged canceled checks with your monthly statement. Minimum balance to avoid imposition of fees – A maintenance fee of $6.99 will be imposed every month if the balance in the account falls below $200 any day of the month (waived for Senior Citizens age 55 or older). Fees – An Excessive Debits Fee of $5 will be assessed for each transaction in excess of six per month (waived for Senior Citizens age 55 or older). See Transaction Limitations below. Transaction limitations – Transfers from a Regular Savings account to another account or to third parties by preauthorized, automatic, telephone, or computer transfer are limited to six per month with no transfers by check, draft, debit card, or similar order to third parties. Accrual of interest on noncash deposits – Interest begins to accrue depending on where noncash Items originate (for example, checks). Interest begins to accrue no later than the business day of deposit for Items that are drawn on Bankers Trust and no later than two business days following the day of deposit of other Items. Minimum balance to avoid imposition of fees – A maintenance fee of $12.99 will be imposed every month if the balance in the account falls below $1,000 any day of the month. Fees – An Excessive Debits fee of $5 will be assessed for each transaction in excess of six per month. Additionally see Transaction Limitations below. Transaction Limitations – Transfers from an Investment Savings account to another account or to third parties by preauthorized, automatic, telephone, check, draft, or computer transfer are limited to six per month with no transfers by debit card to third parties. Minimum Balance to Avoid Imposition of Fees – A maintenance fee of $3.00 (plus applicable sales tax) will be imposed every statement cycle, after the first three statement cycles, unless you maintain a minimum daily balance of $500.00 each day for the monthly statement cycle. This maintenance fee will not be imposed in the first three statement cycles after you open your account. Frequency or rate changes and determination of rate – At our discretion, we may change the interest rate on your account at any time. Compounding and crediting frequency ­– Interest will be compounded every month. Interest will be credited to your account every month. Daily balance and computation method – We use the daily balance method to calculate the interest on your account. This method applies a daily periodic rate to the principal in the account each day. Termination fees – A termination fee of $25 will be imposed when the account is closed. Overdrafts – If an Item is presented without sufficient funds in your account to pay it, whether it is presented in the form of a check or an ACH Item, we will return the Item unpaid (Returned Item) except for any Item which we deem the Bank is legally obligated to pay. If an Item is so paid without sufficient funds in your account, an overdraft will be created. Whether the check or ACH Item is paid or returned, the Overdraft/Returned Item fee will be assessed as disclosed in the Service Fee Schedule later in this document. ATM and debit card withdrawals that create an overdraft will generally be declined. There are limited circumstances when an ATM withdrawal or debit card withdrawal may be approved creating an overdraft. This may occur when, for example, the system is offline or the merchant does not obtain prior authorization for the transaction. Overdraft/Returned Item fees will not be assessed for overdrafts created by debit card. The Internal Revenue Service (IRS) defines an overdraft on a Health Savings Account (HSA) as a prohibited transaction. According to IRS Code, if an HSA holder engages in a prohibited transaction, the HSA will cease to be an HSA on the first day of the year in which the prohibited transaction occurred. Further, the bank must treat the HSA as if all the assets were distributed on the first day of the year in which the prohibited transaction occurred. All overdrafts, including those created by a transaction, a fee, or an oversight, are prohibited. If an overdraft occurs on the HSA, the bank is required to close the account and report the January 1 balance as a nonqualified distribution. Nonqualified distributions are includible in your gross income and may be subject to a penalty. Further, if Items are returned unpaid (Returned Item) on four or more occasions in any rolling 12-month period, your HSA will be closed whether or not the transaction resulted in an overdraft on the HSA. Bankers Trust urges you to use the utmost care in managing your HSA account to avoid overdrafts and the possible closing of your account. Contributions – All deposits (or transfers resulting in a credit to your account) are considered to be contributions made for the current year. In order to make a carry-back contribution for a specific tax year, you must come into a branch and notify us of the appropriate tax year by completing a HSA Contribution/Investment Form. Account owner assumes complete responsibility for: 1.) determining eligibility for the Health Advantage / Health Advantage Corporate account every year contributions are made; 2.) ensuring all contributions are made within the limits set forth by the laws; and 3.) tax consequences of any contributions (including rollover contributions) and distributions. Health Advantage Card (Debit Card) and Electronic Transactions – We permit some electronic fund transfers to and/or from your HSA. The electronic fund transfers we permit are offered for the convenience of managing your HSA. However, electronically moving funds to or from your HSA — for example, depositing more than the allowable amount, or getting additional cash back on an HSA debit card transaction — can raise a variety of tax concerns. As a result, before electronically accessing any account you may have with us, it is good practice to make sure you are using the correct access device (such as a card) or accessing the appropriate account for the transaction. Also, it is your responsibility to ensure the contributions, distributions, and other actions related to your HSA, comply with the law, including federal tax law. We recommend consulting a legal or tax professional if you have any questions about managing your HSA. Please see the Electronic Fund Transfers: Your Rights and Responsibilities section for a complete disclosure of electronic fund transfers services. The interest rate and annual percentage yield (APY) are effective as of December 18, 2018, and may change without notice. Fees may reduce earnings. You may call 1-800-362-1688 to obtain current interest rate information.